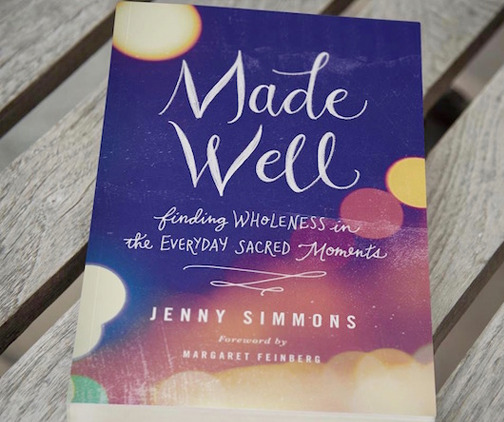 I recently finished reading Jenny Simmons’ latest book, Made Well: Finding Wholeness in the Everyday Sacred Moments. Made Well is full of stories – stories that will make you laugh and stories that will probably cause you to shed a few tears. All of the stories remind me that healing is possible but often comes in unexpected ways. This quote resonates so much with me. The truth is, God doesn’t always answer our prayers the way we would like. For 9 years, I watched my mom battle breast cancer, and I prayed that God would heal her. I wanted that healing to take place here on Earth, but instead my mom was healed when she met Jesus. What does healing look like for those left behind after a devastating loss? God often reveals His love to us through others. Many times it’s through simple acts: someone brings us food or runs errands for us, we receive a card or text/e-mail, someone asks us to share memories of our loved one, or they are willing to simply sit with us in our pain. Being “made well” doesn’t mean our grief disappears. Instead, it’s love displayed in ordinary moments. Moments that give us hope in the midst of our grief. Jenny invites us into her journey of seeking help for anxiety, OCD, and ADHD. She reminds us that God does amazing work through counselors, doctors, and sometimes He even uses medication to bring healing. It was so refreshing to read this, as many people think it’s a sign of weakness to ask for help. I used to be one of those people. Now, I see asking for help as a sign of strength. Like Jenny, God brought healing to my life through a Christian counselor. Sitting in her office that first session and naming my “broken bits” was scary, but it was a huge step on my healing journey. Healing has come through the love and support of family and friends, learning healthy ways to deal with my emotions (writing, exercising, music), connecting with other survivors of abuse, and reading books, articles, and blogs by people who honestly share their experiences. Realizing I’m not alone has brought comfort and hope. Healing has come through words of truth spoken by pastors and friends at my church. While I still struggle at times with feelings of shame, guilt, and unworthiness, they have reminded me of who I am in God’s eyes. Do you desire healing? If so, allow others to walk with you on the journey. God still performs miracles, but many times healing happens in the small everyday moments of life. It may even happen while reading the words and stories of Made Well.